Glass Flowers. Photo courtesy of Harvard Museum of Natural History (www.hmnh.harvard.edu). Where can you see the colors of spring all year long, or the flame-like blaze of an autumn maple leaf even in the dead of winter? 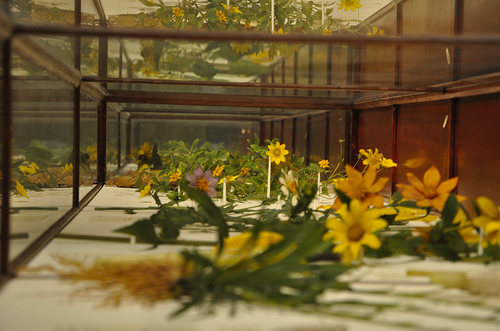 Visitors to the Harvard Museum of Natural History can witness the forever-blooming botanicals that make up the Ware Collection of Blaschka Glass Models of Plants, aka The Glass Flowers, a fragile collection of flora first created over a century ago by the glass artist father and son team of Leopold and Rudolph Blaschka. Leopold, a glass artist who lived near Dresden, Germany, had a thriving business making glass models of marine creatures that were sold to museums all over the world, including Harvard's, where his delicate works of beauty caught the eye of Professor George Lincoln Goodale, founder of Harvard's Botanical Museum. Between 1886 and 1936, Goodale commissioned, for the purpose of teaching botany, the 3000 models of 847 different plant species, all created by Leopold and Rudolph. The father and son worked together for ten years until Leopold's death in 1895, and then Rudolph continued alone for another 40 years. In addition to being highly-skilled craftsmen, the Blaschkas had a remarkable understanding of botany and were able to create specimens that are scientifically accurate. Thus The Glass Flowers "blossomed" and remain as timelessly beautiful as ever, since they first opened to the public on April 17, 1893. Noted glass artist Dale Chihuly considers Harvard's Glass Flowers one of his favorite glass collections. "It is an unbelievable collection," he told Art Business News. "No one really knows how they did that; it is mind-boggling and extraordinary." Glass model of Blaschka Red Maple. Photo courtesy of Harvard Museum of Natural History (www.hmnh.harvard.edu). 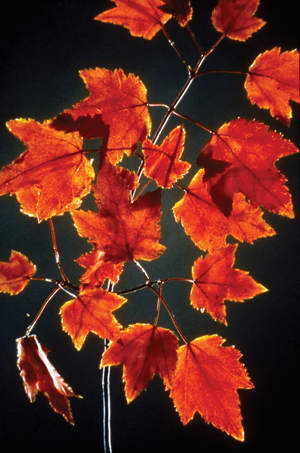 Says Blue Magruder, Director of Communications for HMNH, "We've had a few visitors recently comment that the finest fall color they've seen so far in New England is the extraordinarily realistic glass model of the Red Maple." Another exhibit at HMNH, the recently-opened New England Forests, also showcases extraordinary botanical models, but these were created using 21st century epoxies by the Chase Studio in Missouri. The exhibit explores the natural history and ecology of forest communities in the New England region. Along with the amazingly realistic plant and tree life, this exhibit also features dozens of taxidermy specimens of wildlife, from woodland caribou and moose down to tiny models of aquatic insects, and engages visitors in understanding the complex relationships that exist among these creatures. On December 2, Ghost Orchids, an eerily beautiful glass sculpture by Scottish artist Siobhan Healy, will go on display in The Glass Flowers gallery. The inspiration for the artist's subtle and thought-provoking piece is the Ghost Orchid (Epipogium aphyllum), a rare British wild flower recently rediscovered after it was thought to be extinct for 23 years. Healy depicts the orchid in transient and ethereal clear glass, encouraging the viewer to reflect on the potential loss of this fragile species—an evocative emblem of the one in five wild flowers that are threatened with extinction. Ghost Orchids will remain on view through March 4, 2012. The Harvard Museum of Natural History is a Boston CityPASS attraction. General admission to the museum grants you access to all exhibits, including The Glass Flowers, New England Forests, and Ghost Orchids.